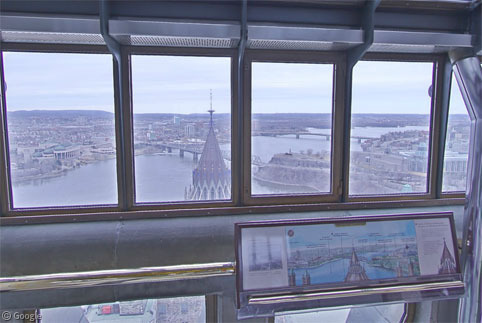 Perhaps skip reading this post if you don’t have a head for heights – today we’re heading up to look at the scenery from a few observation towers that have been visited by Google’s Street View cameras1. 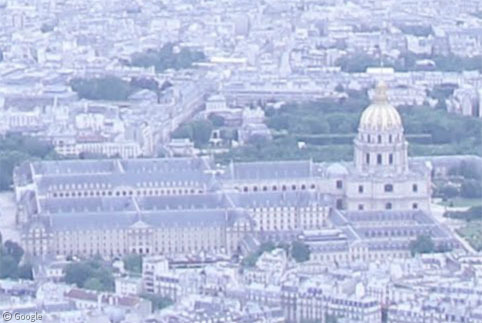 First up, the Eiffel Tower in Paris, which overlooks the Champ de Mars. As we can see from ground level, there are three observation levels. 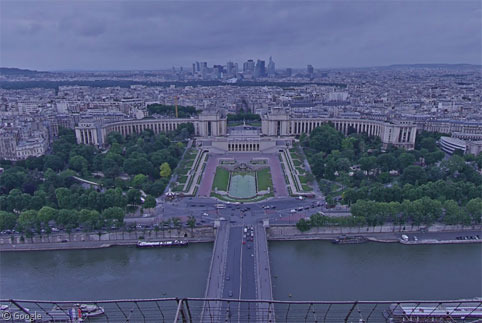 The first – up 300 steps, or a short lift ride – houses a large restaurant named Le 58 tour Eiffel. 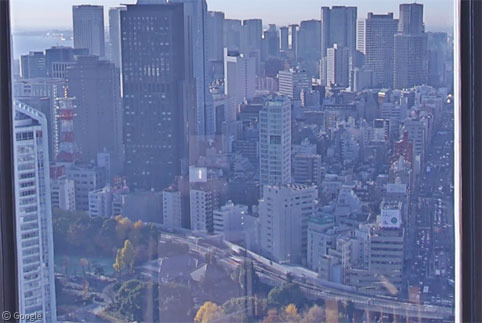 There is no Street View at this level. When the Tower opened in 1889, it was the tallest man-made structure in the world, a record it held for the next 41 years. About 7 million people visit each year, though the queues to get in are legendary. Another 300 steps bring you to the second observation level, from which the opening image, above, was taken. 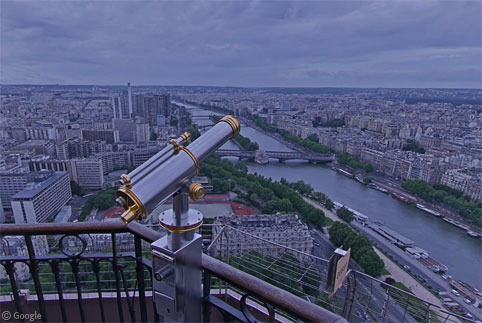 This level also gives unobstructed views along the Seine in both directions, with telescopes in each corner if you want to see more distant object. This level also features the Michelin-starred restaurant Le Jules Verne, and an excellent view over the Jardins du Trocadero. The third level is accessible only by lift, and – at 276m (1,063′) – is still the highest observation platform in the EU. 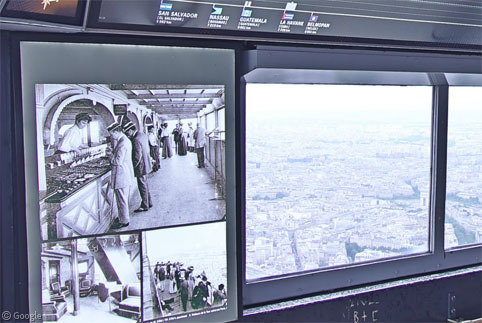 The lower part is glassed in for views across the city, and has displays of historic photos taken in the Tower’s early days, as well as signs showing the direction and distance to capital cities of other countries around the world. In the distance we can see the Musée de l’Armée. The upper part of this third level is open air, but fenced in for safety, so the views aren’t quite as clear. 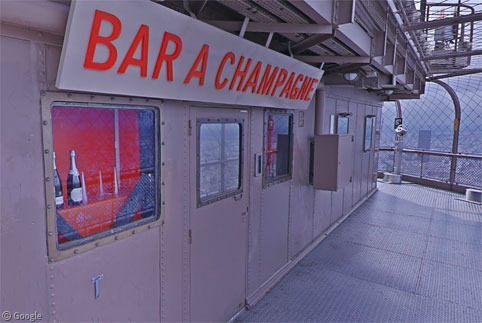 There is however a champagne bar, should you wish to celebrate your trip to the top of this iconic structure. 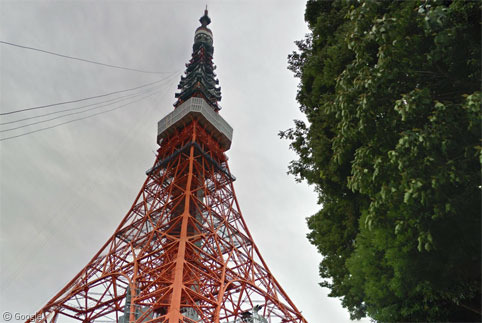 To Japan now, where two towers are available on Street View, including the capital’s Tokyo Tower – the country’s second-tallest structure2 at 333m (1,093′). 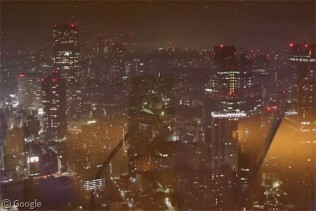 The Street View cameras visited the tower twice, to capture the city both at day and at night. 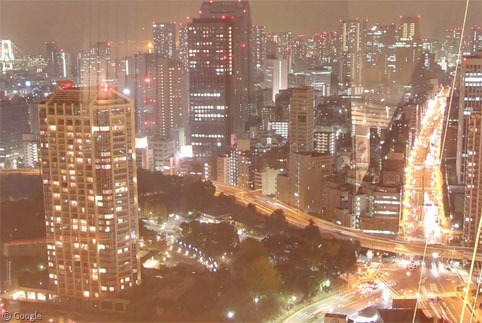 The night-time views in particular, like this one from the lower level of the main observation deck at 150m (492′), give a very Lost in Translation look at the city. This lower level also includes a café where you can sit and admire the view. Imagery of the upper level was captured during the day – here’s the same view as above. 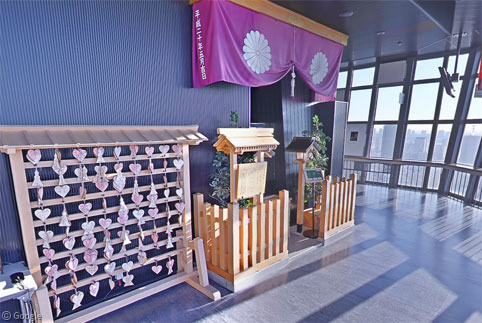 There is also a Shinto Shrine on this level. For an extra fee you can take the lift up another 100m (330′) to the Special Observatory, where day and night views are also available. 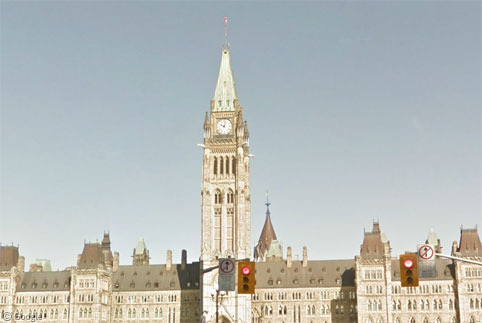 Now to Canada’s capital – and this writer’s home town – Ottawa, where the Street View cameras took a detailed tour of the Parliament Buildings, including a trip up the 92m (302′) Peace Tower (Wikipedia). 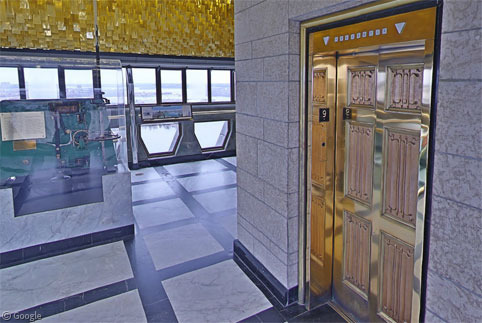 No champagne bars here (it’s actually quite a cramped space), but the lift doors are certainly very grand, and the ceiling is decorated gold. This sweeping vista takes in the Ottawa River, the newly-renamed Canadian Museum of History and the very excellent National Gallery of Canada. 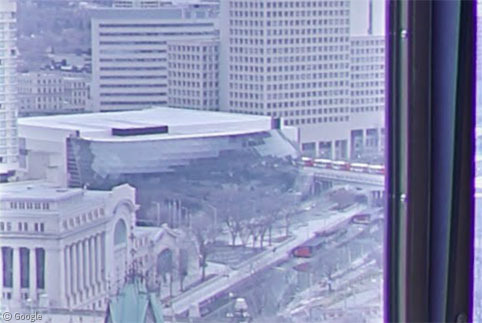 And here we can see the former train station (now a conference centre), the convention centre, and the Rideau Canal, which we featured in a post a number of years ago. 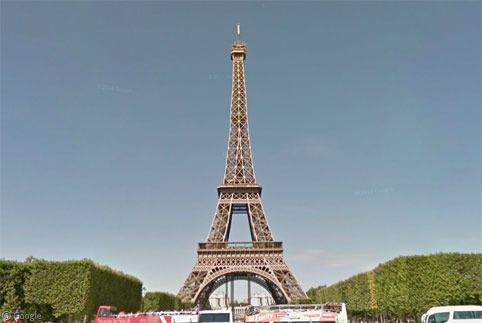 If you know of other towers available on Street View, please post them in the comments. This is the fourth in an occasional series about out-of-the-ordinary imagery from Google Maps. In the first we visited wintery locations around the world in Google Snow View, in the second we looked at rivers, canals and oceans with Google Boat View, and in the third we explored beneath the surface of the world’s oceans with Google Underwater View.